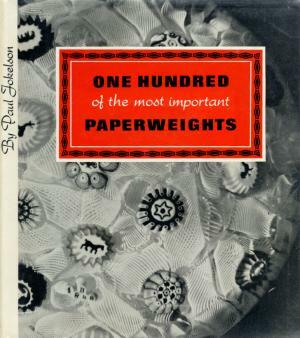 In this book Paul Jokelson selects 100 paperweights and assigns them the distinctive label of most important. In doing so, he shares his opinion with us and sets a standard for collectors. How nice it would be to have a collection with examples similar to each of the 100. A goal perhaps for each of us. This is a picture book with only a minimum of text in French and English. The important thing is the pictures. There is a full page print for each of the 100 paperweights. On the facing page, there is sometimes a very brief description and an identification of the collection that owned the weight. The descriptions are too brief. In the case of the horse weight illustrated, the description says only "The horse is a colored sulphide" and identifies this as being in the Bergstrom Museum. In selecting his list of 100 paperweights, Jokelson says he sorted through over 8,000 examples. Clearly a difficult task although he hedges in the introduction by pointing out that the title is not THE 100 MOST IMPORTANT, but 100 of the most important. That leaves us wondering how wonderful it would have been to have a book (no matter how many volumes long) with the complete catalog of all 8,000. 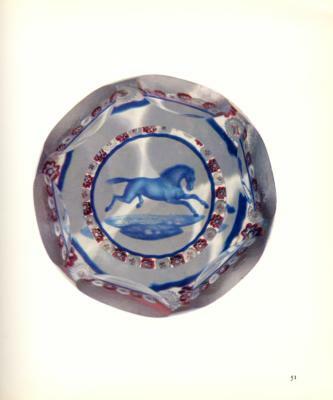 This was Jokelson's second book and, as such, was an important book in the history of paperweight collecting. Every collector should have a copy. 239 pages with 100 full color plates. Additional section dividers are in black and white. 8 1/4" by 9 1/4". Hard cover. 1967. Limited edition of numbered 2000 copies.